Courtney Singer-Coseglia (CAS ’18) looks on in anticipation during Frozen Fenway, where the band cheers on the Terriers in an annual winter game at Fenway Park. Photo courtesy of Courtney Singer-Coseglia. The Boston University Men’s Hockey team will head to Worcester, Mass. to face off in the first round of the NCAA tournament this Saturday at 1 p.m. The Terriers earned their ninth Hockey East Championship title in university history last weekend and look to carry the momentum forward to topple the top-seeded Cornell University. In such a high-stakes game, all eyes will be trained on the ice; but all ears will ring with the sound of the Boston University Pep Band. Dubbed the “hardest working pep band in college athletics,” the Pep Band is comprised of more than 130 students from different colleges and majors throughout the university. From students who have been playing their instrument since elementary school to students who picked up an instrument for the first time this semester, the Pep Band is an inclusive environment open to anyone with a desire to make music. Performing at more than 150 events each year, the Pep Band plays at all hockey and basketball home games for both the men’s and women’s teams, along with occasional ventures to other sporting events or performances around the university. However, at this point in the season, all attention is turned to Men’s Hockey. Finding their home in Section 118 of Agganis Arena, just above the Dog Pound—BU’s raucous student section—the Band provides a lively soundtrack for Agganis’ crowd at each game stoppage. In a playlist comprised of more than 100 songs, tunes range from modern hits, such as DNCE’s “Cake by the Ocean” to traditional Boston favorites, like Dropkick Murphys’ “Shipping Up to Boston.” At the end of each period and following each goal, BU’s fight song rings through the Arena. With a carefully curated playlist and a tremendously vocal presence, the Pep Band commands attention at each game. However, once a year, the Pep Band takes center stage (literally) with a performance on the ice during intermission. Each year promises a unique show with a new song memorized specifically for the event and a marching performance sending members around the rink. The clarinet section of the BU Pep Band at rehearsal on the rink at Agganis Arena prior to the annual Pep Band On-Ice show. Photo courtesy of Vincent Launh. 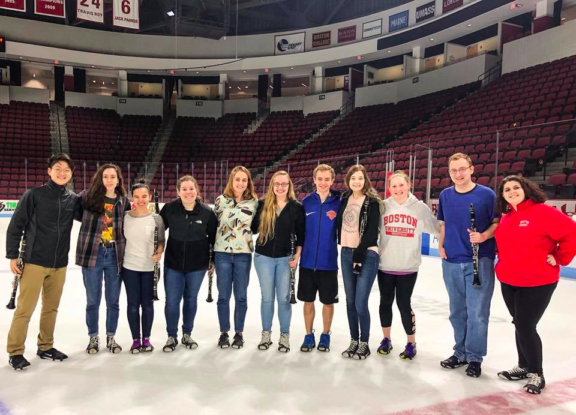 For Lauren Yee (CAS ’19), BU Hockey games aren’t often a large part of her college experience; however, the opportunity to watch the Pep Band perform on ice was enticing enough to justify a trip to Agganis. Christina Fontana (ENG ’18) recognizes the importance of this energy and connection with the crowd and views the Pep Band as an integral component of the BU hockey experience. A common sentiment among members is that the Pep Band emerges as nothing short of a family—a way to make the sprawling student body of BU feel a little smaller. The Pep Band offers the opportunity to become more deeply embedded in the BU community, providing not just a reason to attend games but a group of best friends to enjoy every experience with. And the joy of the Band isn’t just contained to the members themselves. One of the Band’s 23 seniors, Courtney Singer-Coseglia (CAS ’18), has been a member of the BU Band family for the entirety of her BU career. She has been a member of both the Pep Band and the Marching Band, along as a sister of Tau Beta Sigma, a National Honorary Band Sorority.